Party marquees are a great option for any event and with several sizes available, marquees can be erected within any venue. County Marquees have a selection of marquee styles available in Droitwich Spa and will always discuss customer requirements to tailor every marquee specifically to our client. Using clear span marquees and modern day technology, our marquees can be used at any event, suitable for most weather conditions. 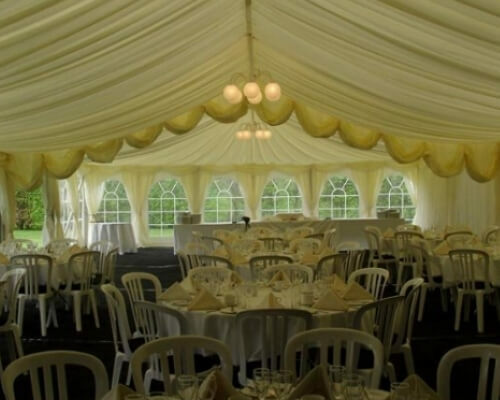 With several options when selecting your marquee, they can be used to create any atmosphere, fitting with any parties and events you have in Droitwich Spa. When you require party marquees in Droitwich Spa, our team can always provide marquee hire at fantastic prices. With personalisation available for our marquees, hiring is a great option and also saves you money from purchasing your own marquee. Our marquees can cater for any number of guests, with sizes ranging to 100’ in length and 30’ wide. 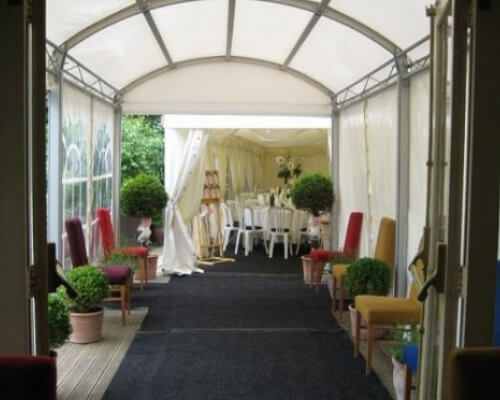 With several furniture items also available, finding a suitable marquee is easy with our team. Party marquees are available in various shapes including our Chinese top marquees. This marquee type has an oriental style high roof and is great for both small and medium-sized parties. We also have other marquee roof styles available and will always discuss the many options when speaking to our clients. All roofing styles can be decorated in an effective way, with many lighting and colour scheme options to choose from. Within our marquees, we have several design options with swags, linings, furniture and lighting styles available on every party marquee. We understand the planning that goes behind every event and our team will always assist with the decoration of your marquee, making this process as easy as possible for every client. With the furniture we have available, we will always discuss your requirements, ensuring the furniture that is set up always fits with the party or wedding style. Any special requests you have for the marquee will be completed, allowing you to have complete customisation over the layout and design of the party marquee. This furniture can always be tailored and altered to meet your needs, with different colour schemes to suit the rest of the marquee and your venue and event. Our lighting options also vary from chandeliers to night skies. Our lighting is a great option to create an extra effect at any event and build a fantastic party atmosphere within the marquee. On the day of your event, we will arrive early at your venue, ensuring the marquee is immediately set up and that all furniture is laid out correctly. We also add distinctive and personal touches such as table centrepieces that have been chosen for you, making the marquee a great option to have a venue that is personal to you for your event. The marquee will always be set up in time, ready for any number of guests, with the size also tailored to you. Droitwich Spa is a town located in the county of Worcestershire, situated on the River Salwarpe. The town is famous for being on top of massive deposits of salt, which have been extracted since ancient times for use. Droitwich Spa is a beautiful area and somewhere we always look to provide our marquees for any venue of your choice. With easy transport into the town, marquee hire is always available to clients located here. Despite not being a large town, Droitwich Spa is still home to many fantastic attractions that make it a great area for the locals and visitors. Some of the biggest landmarks located in Droitwich Spa and the surrounding areas include Hanbury Hall, Droitwich Spa Lido, Jinney Ring Craft Centre, Webbs of Wychbold and Norbury Theatre & Cinema. This is just a selection of landmarks located here, with many other points of interest perfect for visiting. 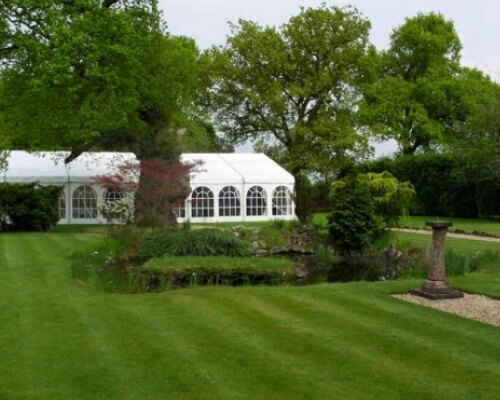 County Marquees have always provided party and wedding marquee hire throughout the Droitwich Spa area since being established. We ensure all clients here receive a fast response to any enquiries and that the marquee hire can be scheduled quickly for the required dates and times you need it. You will always be given details on availability, ensuring the marquee can be used for your event without any issues or delays. County Marquees aim to be the first choice for all party and wedding marquee hire in Droitwich Spa. Since our establishment, we have always chosen to offer a personal service with our party marquees, ensuring every event is prepared perfectly and you have a fantastic venue for any party you host. With complete customisation on the interior and exterior of the marquee, this is always tailored to client requirements. Our marquees have a huge selection of styles available, fitting in with the rest of your venue and the tone you would like for the evening. Our lighting, swags and colour schemes mean you can always create a party atmosphere for all guests to thoroughly enjoy themselves. With marquees from 10’ to 100’, all guests will fit easily within our marquees, with plenty of room for dance floors, food and drink. We dedicate ourselves to every job and want to ensure our clients always have a fantastic time at events in our marquee. 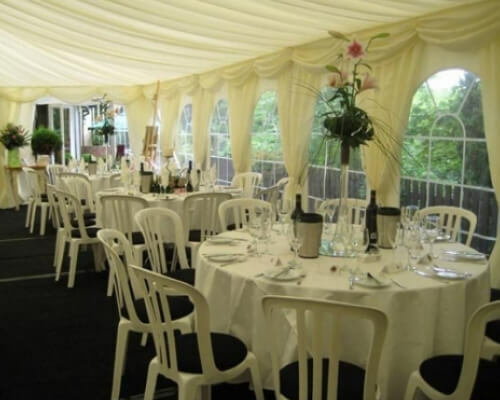 No matter where your venue is in Droitwich Spa, we will ensure the marquee is set up professionally, ready for use at any time. Catering for any additional requests you have with equipment and furniture, you will always be left fully satisfied by County marquees. If you require party marquees in Droitwich Spa, do not hesitate to contact County Marquees. We will always discuss your requirements for any event and ensure the marquee is fully personalised and tailored to you for parties and weddings. Call us today on 07816648624 or 01214232662 or fill in our contact form to make an enquiry and receive a quick response.